In all the years I’ve been writing Gathering Flavors, I’ve never featured a recipe twice. Until today. This Lemon and Lavender Cake has appeared here before. A recipe created by Diana Henry and published in her book, Simple—this cake is indeed simple to make. But don’t be fooled. The flavors are complex while the cake itself is light-as-a-feather. I am reposting it here today because I found it anew on Mother’s Day this year. My family has a tradition of cooking our Mother’s Day celebration meal together after a day of selecting and planting colorful annuals for our garden. My daughter took on the job of making dessert. I watched her follow the recipe closely, carefully measuring each ingredient, squeezing fresh lemon juice, oiling the pan, and monitoring it closely in the oven. 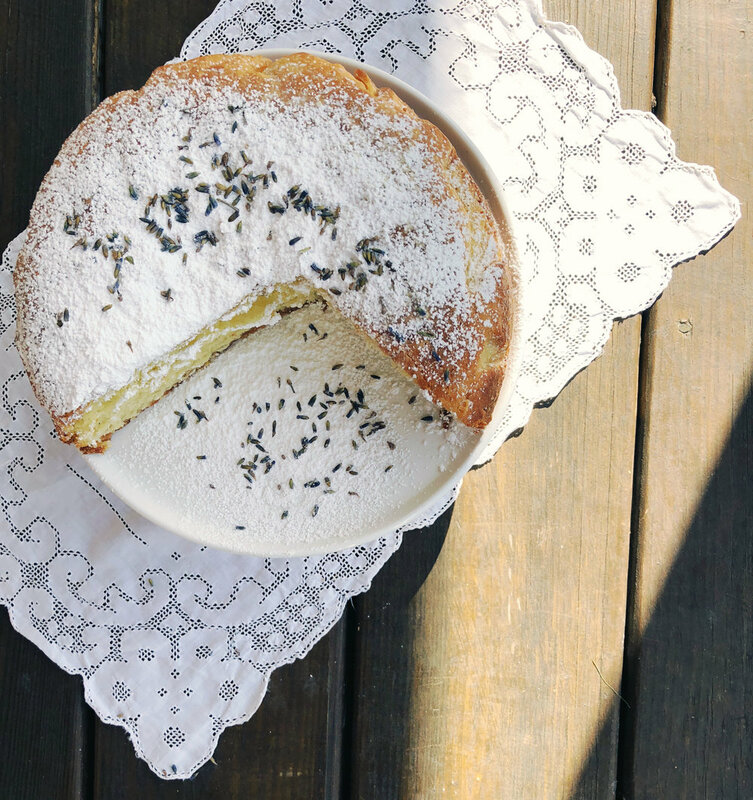 What came out of the oven was something new—a cake that although I’d made it before, tasted almost completely different because it was filled not only with olive and sugar and lemon and lavender—but with her love and her personality. She made it her own and I am ever so grateful. Make this cake your own. Plan to make it again and again this summer and into the fall. Serve it with a cup of coffee for breakfast. Fresh fruit goes well with it, too. Or you can dress your dessert up a bit more by serving it with any of these favorites. Preheat oven to 350 degrees F. Butter an 8-inch diameter, 2 ½ - inch deep cake pan and line the bottom with baking parchment. Put the granulated sugar and lavender into a food processor and whizz until the lavender has broken down. Sift the flour, baking powder, baking soda, and salt together into a bowl. Stir in the lavender sugar. In a pitcher, mix the eggs with the yogurt and oil. Make a well in the center for the dry ingredients and gradually stir in the wet ingredients. Add the lemon zest and juice, but don’t over-mix. Scrape the batter into the prepared pan. Bake for 45 to 50 minutes, or until the cake is coming away from the inside of the pan and a skewer inserted into the middle comes out clean. Turn it out, peel off the paper and set on a wire rack until cold. Dust with confectioner’s sugar just before serving and decorate with sprigs of fresh lavender, if available. This recipe is from Simple by Diana Henry. If you make this recipe, enjoy. And, please take a photograph to post on Instagram with the #gatheringflavors. You can read my original post of this recipe here.